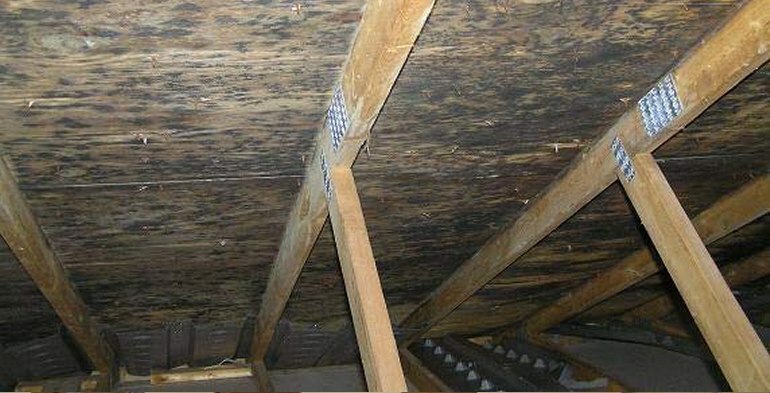 Attic mold can hold up the sale of a home. Homeowners don’t usually notice it until it’s pointed out by a building inspector. And they don’t call an inspector until they’re getting ready to sell or buy a home. This leads to costly delays. In 90% of moldy attics, the sheathing (boards or plywood covering the roof framing) will be black (possibly with the infamous ‘black mold‘). If you can see attic mold, removal is necessary. Eliminate the causes, eliminate the mold. Soffits (overhangs) aren’t ventilated or they’re blocked by insulation. No gable vents (at the inverted “v” of the roof). No ridge vent (going the length of the roof at the top). A bathroom’s exhaust venting into the attic. Moisture escaping the bathroom hits the sheathing, and cold air outside creates condensation inside, creating mold-optimal conditions. Chimneys with improper flashing (material used to prevent leakage). These issues, coupled with other mold-friendly conditions, creates mold problems in the attic and must be corrected. First, the ventilation and water issues must be addressed. There’s no sense in removing the mold until you remove the conditions that let it grow. 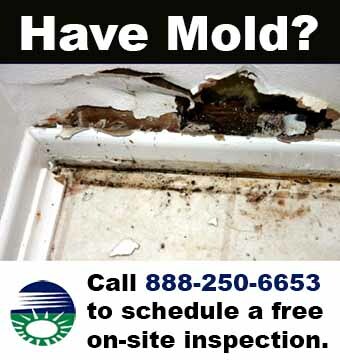 When you eliminate the cause, only then can you eliminate the mildew and mold. The attic mold removal and abatement process includes correcting any ventilation defects, and removing and replacing insulation. It is not usually necessary to replace sheathing. Contain any materials not receiving treatment with 6 mil. poly plastic . HEPA vac all surfaces receiving treatment. Apply biocide throughout (preventing mold from regrowing). Supply negative air (for all jobs) to keep any contamination from spreading. All our mold remediation products are environmentally friendly, and very green!